Creamy and delicious Red Velvet Hot Chocolate will warm you up on a cold winters day or any day! 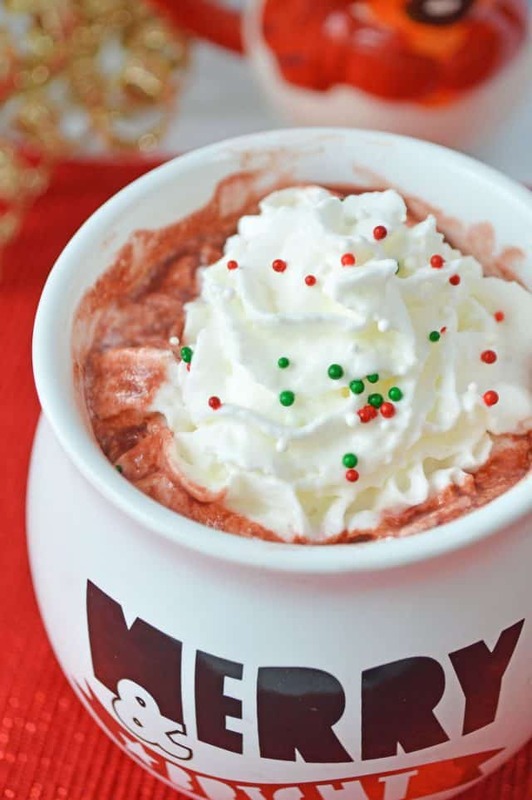 Festive and easy to make! 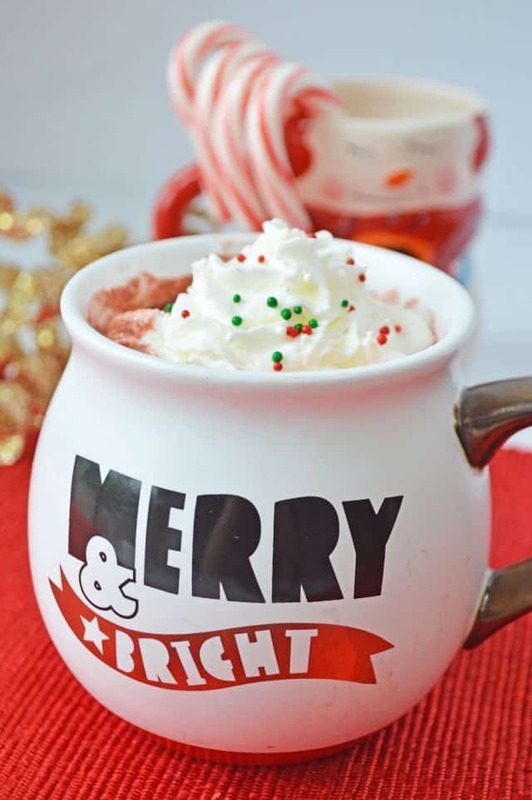 Who doesn’t like getting cozy by the fireplace with a mug of hot chocolate? We are all about getting cozy comfy this year. The wood is stacked, the lights are up and we will pick out our tree this weekend! There is a chill in the air and I really need some hot chocolate. 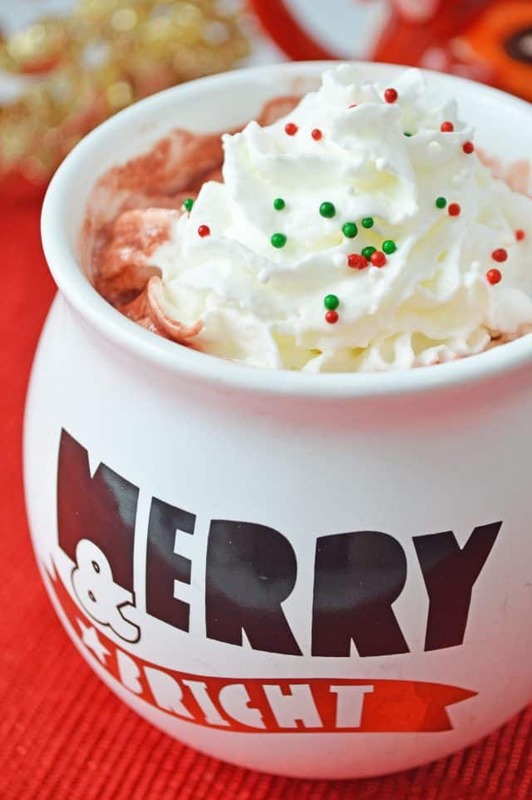 Grab a mug and get cozy with this Red Velvet Hot Cocoa. 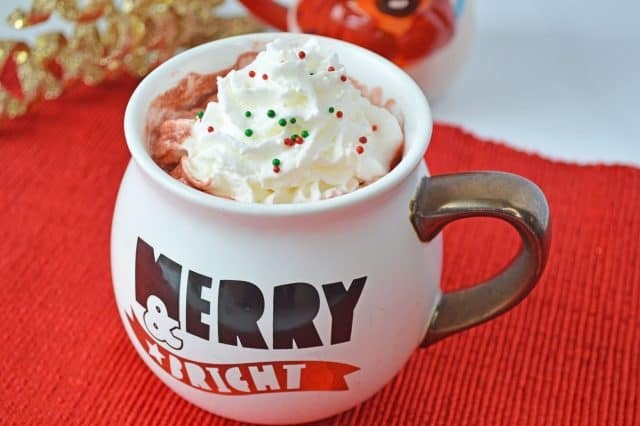 My birthday is tomorrow and it is absolutely perfect starting off my day with a mug of Red Velvet Hot Chocolate! I love red velvet cake, so that will be my birthday cake this year too! 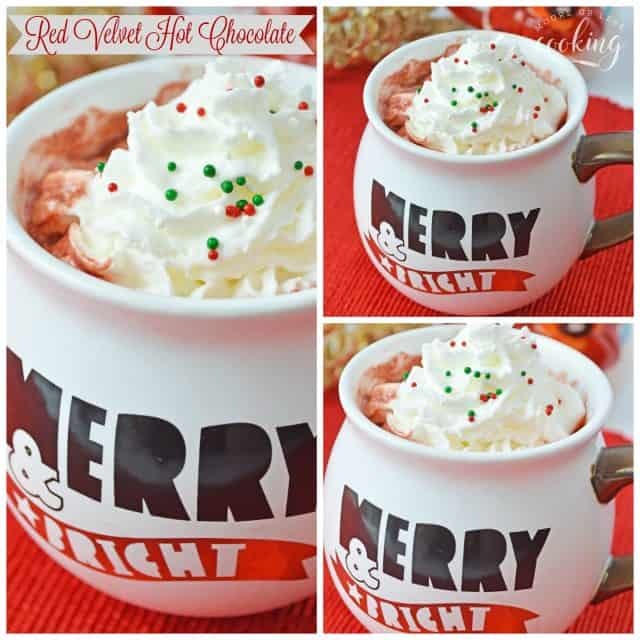 This Homemade Red Velvet Hot Chocolate is the perfect Christmas or Valentine’s Day treat. It only takes a few minutes to whip up, and the creamy, chocolaty taste is unbeatable. Christmas time is here and the weather is really starting to get cold. 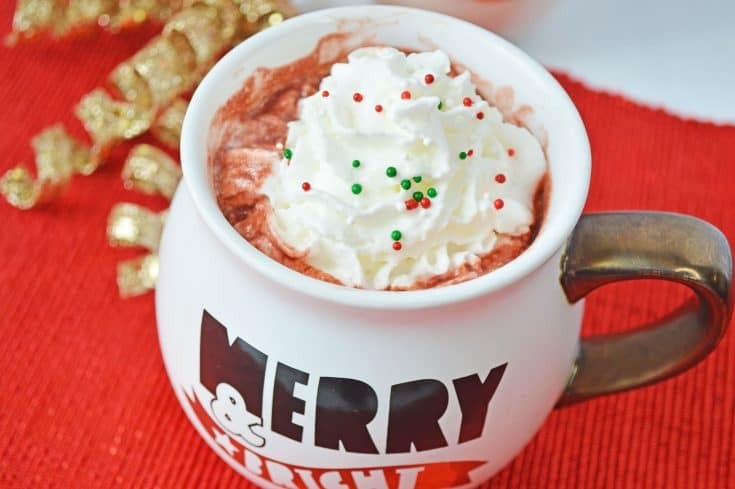 This hot cocoa recipe will keep you warm this season. This recipe is easy to make without crazy ingredients. Have a Merry Christmas! My 3 year old grand daughter is obsessed with hot cocoa, in any form! I love finding new recipes around the holidays and this one is sure to make yours a little more special! COULD I MAKE THIS RECIPE USING ALMOND MILK? Yes, absolutely. 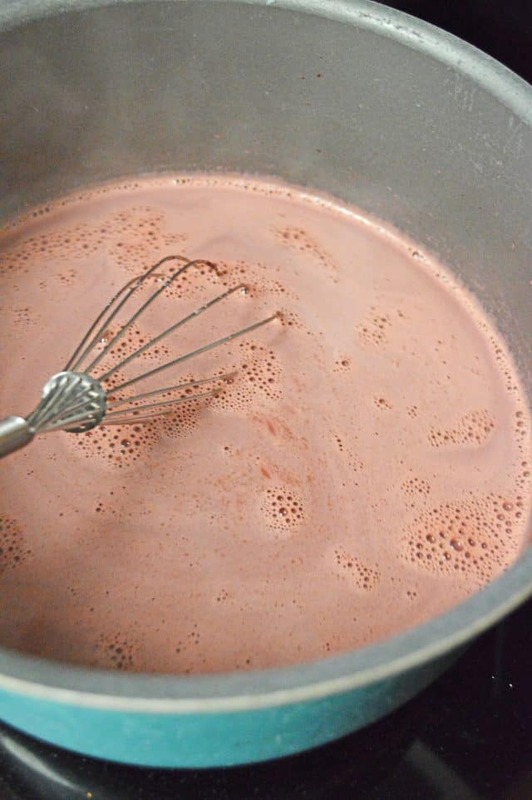 Although, the hot chocolate won’t be as creamy and won’t be as chocolatey. 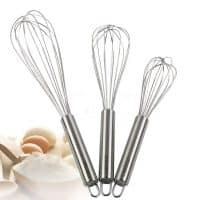 If you are using almond milk, I recommend adding a flavor, or buying some with a little sweetener, where almond milk can be a little more bland and bitter. 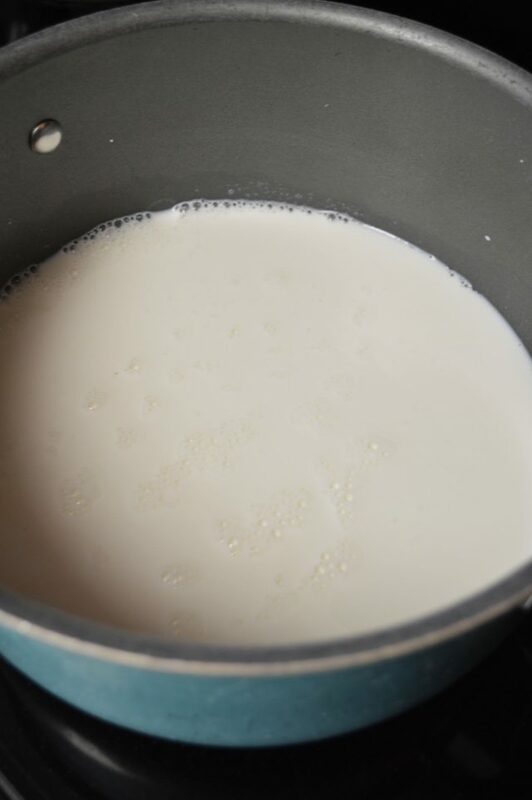 In a large pot, heat the milk. Whish in chocolate and food coloring. Pour into a mug. Serve with Whipped Cream and sprinkles. I love adding toppings to my hot chocolate. Crrushed candy cane is delicious. Peppermint is wonderful combined with chocolate. 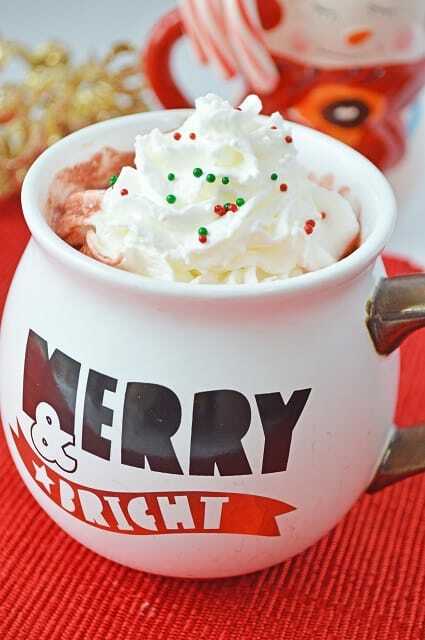 Whipped cream, cinnamon or nutmeg is so yummy in my hot chocolate. It makes it so creamy, and adds just the right amount of spice when you add some seasoning. I just learned how to make chocolate spoons, those are fun and delicious stirred into Red Velvet Hot Chocolate too! 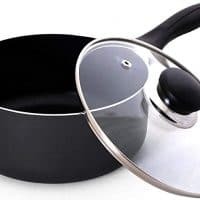 Combine milk and sugar in a large pot. Heat on medium heat until milk begins to simmer. Simmer 2-3 minutes, until sugar is dissolved and milk is heated through. Add chocolate chips and red food coloring. Stir 2-3 minutes more, until chocolate is melted. This is such a tasty idea! :]! Can’t wait to try it! Happy early birthday!